How do you spend your holiday time? For the Fourth of July and the weeks surrounding it, people spend a lot of time playing and partying with friends--pool parties, cookouts, firework shows, and the like claim a great deal of our time around the summer holidays. Where there’s overloads of fun, of course, there are dangers for which to keep watch. Here is a quick list of playtimes that can turn into danger zones quickly and a few of the hazards you might want to consider. Mind you, we are not telling you to avoid going out and enjoying these activities, but rather reminding you to be careful and stay safe over Independence Day weekend. 1) Water Games -- For me, personally, the best part of summer is the water. Whether it’s an afternoon at the beach or an invite to use someone’s pool, I am always ready to dive in and splash around. However, water can be incredibly hazardous. Drowning is the obvious concern, but boat accidents and even hard slips due to a wet floor can be a problem as well. Be sure that you understand your own swim level. Make sure that you or someone nearby understands basic CPR and first aid. If you are going to be at the beach research your destination. Make sure you know what hazards exist in the area (sharks, jellyfish, riptides, you know), and keep track of the weather. Exercise the necessary precautions, and you should be just fine. 2) Grilling Time -- Everyone loves a big hearty meal at the cookout. Burgers & dogs, chicken & steak, kabobs, grilled veggies, chips & dips, salads both potato & macaroni, watermelon hunks, and now I’m hungry and just listing off things I hope to eat this weekend. The biggest concern with these is, clearly, choking. Improper chewing techniques or bites of outrageous size, something may get caught in the wrong pipe. You should learn proper choking aid techniques so that you may act in an emergency. (The Heimlich maneuver actually has a much higher success rate than you might immediately suspect.) Also, keep an eye out for steel hairs from the grill brushes, as they can reek havoc on your insides if accidentally ingested. Make sure that all food is cooked to an appropriate temperature and stored or tossed within a sensible timeframe (salmonella is not a fun game to play over the holidays). Exercise the necessary precautions, and you should be just fine. 3) Fireworks -- The bangers may be particularly dangerous for kids, but adults are not immune to their violent delights nor violent ends. 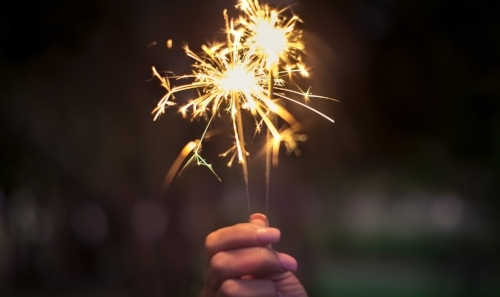 Sparklers can be as bright as welding irons and shower you with sparks. Roman candles spout fireballs like Mario. Bottle rockets fire off with a ZIP and a BANG. Any one of them could be the cause of a serious injury. Follow the instructions, utilize common sense, and do not point them at people or yourself. Always, always, always, be extra careful with firecrackers, or *BOOM* “Ooh… Aah…” can too quickly become *BOOM* “OOW! AAH!” and leave you wondering how it all went wrong in the length of a finger snap (assuming you can still snap your fingers). Exercise the necessary precautions, and you should be just fine. 4) Drink Responsibly -- This is the Rule #1 I really want to implore on you. If you do choose to imbibe alcohol over the course of your holiday, do so responsibly. Don’t drink to excess, and always have a sober companion. Never operate any vehicle while under the influence. Keep your wits about you. Seriously, exercise the necessary precautions, and you should be just fine. Yes, I’ve been a little cheeky while discussing some of this stuff, but that’s to be expected. When a holiday rolls around everyone’s silliness factor kicks up a notch or two. Besides, no one wants to ruin your vacation time. Still, these are some things of which to be cautious when you’re cutting loose this week. Go out, stay safe, and have fun! Happy Independence Day! The Women’s Clinic, P.A. has been providing quality healthcare to the people of Tennessee for over six decades. Our mission is to be the clinic of choice by providing exceptional and compassionate care for each woman, with personalized attention tailored to all stages of her life. Our office is located at 244 Coatsland Drive in Jackson, TN. You can reach us by calling 731-422-4642 or via our website, www.womansclinicpa.com.